With all the LMS platforms to choose from, Teachery is gaining a foothold in the ever-increasing course-building industry. And if you’re into simplicity and a more basic production, and might need a little prodding to get things done, you’ll want to listen up. 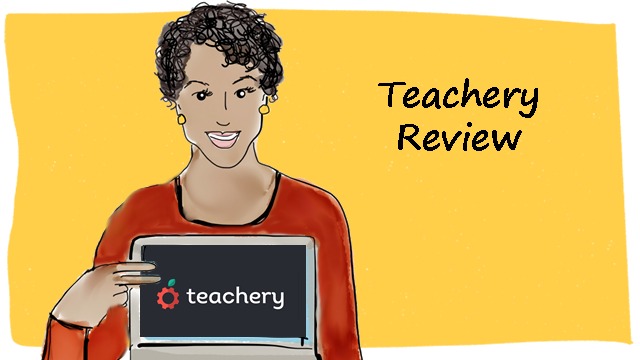 Teachery helps spur you into action, and newer course builders will love how easy it is to use. Teachery is a great option for those who don’t need a ton of bells and whistles and who place more importance on having an easily-made course quickly. So if you’re the type who goes into analysis paralysis when flooded with too many choices and tantalizing avenues, the straightforward approach of the Teachery platform might be your dream come true. Teachery claims you can create and sell beautiful online courses in just minutes (instead of hours or days), without incurring any transaction fees. And I have to say they indeed deliver on enabling you to create a basic course in just minutes. Upon signing up for a free trial, I began a step-by-step process where I start filling in basic information about my course. In a genius flow of prompting questions, they steadily drew information from me (some of which I didn’t even realize I possessed) in a fun series until, before I knew it, they congratulated me on creating a course. Indeed, as Teachery guided me through their info-drawing questions and I happily filled in my flowing thoughts on my flavor-of-the-month course idea as if I were taking some fun online quiz, they were, in fact, building a high-level outline of my course. But after what felt like 10 minutes, I was surprised with a congratulatory page outlining the course I had just created. I mean, sure, the end result wasn’t a fancy-pants vision of wonder, but Teachery had lulled me into creating a full course outline in less time than it takes me to shower when a good song comes on, demanding I belt out a few tunes. And for someone who has a recurring membership to the Procrastinator’s Guild, I was frankly stunned by my own productivity. In addition, having so much great info detailed in an easy-to-read overview actually motivated me to fill out the few remaining details. So I had everything I would possibly need (before selling the course itself) complete in this super short process. When you add in Teachery’s amazing sense of humor (look below to see how they Rickroll you when creating a landing page! ), how easy it is to use, and that crazy burst of productivity from the get-go, it’s a winner in several ways. The best part is, this jolly vibe is carried over into the support side (if you provoke it, anyhow), and their support was impressive for its size, as you’ll see below. All that had me singing their praises, but I hit a few hiccups as I tried to create my course. From there, you can update things like your course logo (which you can directly upload—yay! ), instructor avatar and info, and a welcome message. 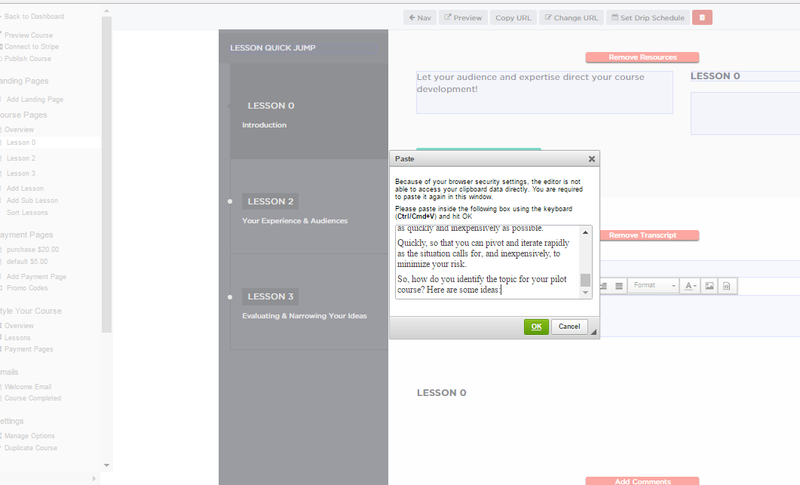 The first hiccup was in adding content to my lessons. As you’ll see below, I got an error saying I needed to re-paste my content. I did so, but it still didn’t populate in the field. No bueno. I tried in a few different boxes in cases I was being dense, but no dice on any of them. After I used the handy-dandy chat box to ask what the deal was, I expected a decent wait for a reply. They pleasantly surprised me by responding in less than half an hour! That’s impressive for a smaller-scale LMS, I’d say. After I got that sorted, I had an issue with the content I pasted in the Transcript part, but the content I pasted in the “Add Content” text block saved just fine. My only complaint was the fact that images and video had to be embedded since Teachery doesn’t host media files for you, but it’s not too big a deal if you can figure how to do some easy embedding. 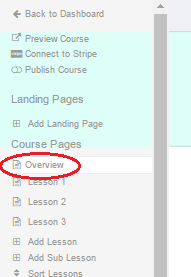 When creating Lessons within your Modules, you need to click on the “+Add Sub Lesson” option in the navigation menu on the left. The rest of the course-building process was simple and easy to finish, and I was able to pop in my content with ease. They have a handy Resources section within each module/lesson. You can easily add a hyperlink to the text, making handouts and homework much easier to share with your students. 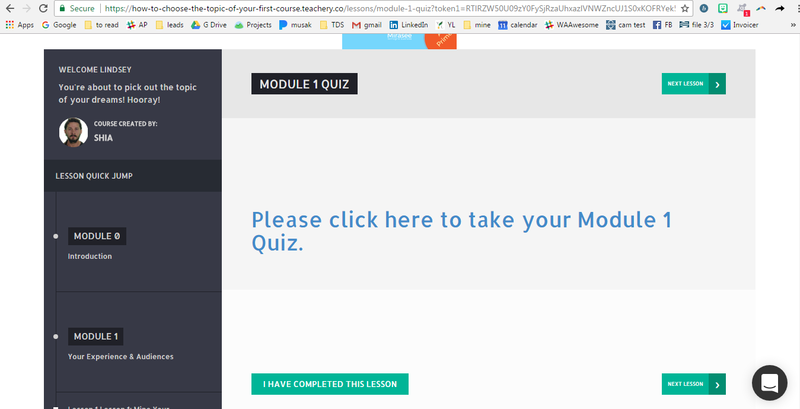 I even created a separate “lesson” that I titled as an end-of-module quiz, and simply added clickable text for them to take their quiz on Google forms. Easy peasy! And, like I mentioned before, in addition to all this great stuff, you get to thoroughly enjoy a steady dose of humor as you create and build. It definitely keeps things fun! Yes, by days out from purchase. Possibly, though only after jumping through hoops. No, but do have the option of sending a welcome email and course-complete email. Can enable comments with Disqus, but need to sign up for a free Disqus account. The first ticket I submitted with questions got a friendly and straightforward response 8 hours later. The second time I reached out, I got a response in less than half an hour from one of the founders himself! I was super happy with the support, and it’s definitely one of their strong suits, especially considering their size. No platform is perfect, and Teachery is no exception. When they’re pitted against some of the bigger guns out there, they might appear feeble. But for having been around just three years, they’ve definitely got the basics. Doesn’t host most content, including pictures, video, audio, etc. 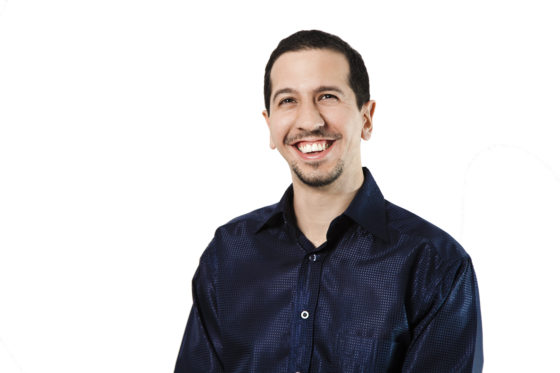 If you want a super speedy setup-to-selling process, aren’t too hung up on hosting, and don’t require a lot of bells and whistles, this might be the platform for you! Same goes if you’re on a tight budget and would like a solid platform that’s wallet friendly. And if you’re a master procrastinator who just needs something put up and ready to deliver in a short amount of time, this could definitely fit the bill. Top-notch support is a huge part of Teachery’s appeal, and even though they’re a smaller company, the fact that founders take the time to interact and reply to customers is awesome. You know they have a pulse on what’s going on, where bugs are happening, what people want, and all the truly important stuff. Not only did I get a timely reply with each ticket, I actually had one of the founders answer my help request (offered within the Teachery site) in less than 30 minutes! And as I mentioned before, the whole company has such a fun and jovial vibe that make you look forward to asking questions! If you’re okay with a basic, no-frills option that will have you taking action instead of trying to decide what color your “Enroll Now!” button should be, Teachery could be just what you need. It will draw your course from your gray matter and get it into digital form, banishing the perfectionistic procrastination monster. 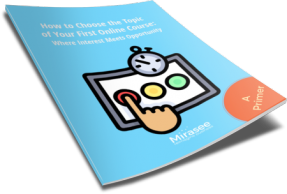 You’ll have a detailed course outline in just minutes, and seeing such progress will likely spur you to take even more action until you’ve got a solid course you can sell within 24 hours of signing up. But if you crave insane graphics, on-site student quizzes, global email integration, multiple payment options, and other higher-end features, it may not be the best pick. I’d probably recommend this platform for first-time course creators, those wanting to test a basic course idea, and anyone who needs that “progress over perfection” kick in the pants. The decision rests heavily on the material you’ll be delivering, your student objectives, and your integration needs. If your course is simple and straightforward, this could be a perfect fit. Overall, Teachery is an efficient platform that gets the job done very inexpensively, but might be an LMS more gung-ho course builders could outgrow given time. I’d feel absolutely comfortable recommending it to beginners and simplicity lovers, but hesitate to endorse it to course builders who need extra features and options. But I can 100% safely say that anyone who interacts with the Teachery platform and its team will appreciate their budget-friendly and “get ’em done” approach. Does Teachery have all the basics you’re looking for? Or is the lack of the bells and whistles a deal breaker for you? Great overview of Teachery. I’ve been religiously following all these LMS reviews to get a good feel for what’s on the market for my own courses as well as for some clients that will be looking to take their training/workshops online. Love that this one has a 14-day trial – it may not be the one for my course needs, but I’m going to try it out so I can better advise my clients on what might work best for them. Thank-you for these very complete platform reviews. It’s always good to know how they would work for a real person. I appreciated your telling us your technology background so we could compare it to our own and then extrapolate how the platform might work for us. Very nice review. I’m trying to figure out which solution we will be using. It can get confusing. LOL! I would like to add for folks coming across this now that they do have a basic and seemingly easy to use affiliate program now, so you might adjust your review accordingly. I know many people are looking for that. Also, I don’t believe they offer the $900 lifetime plan any more. @Dan – Thanks for letting us know of these changes. We will certainly be updating the post every few months or so. Things change so fast!